BEST Value & Lowest Price per SF***Modern & Updated in 2019*** Located in the desirable gated ‘Terraces West’ at DC Ranch with grassy park & children’s play area. 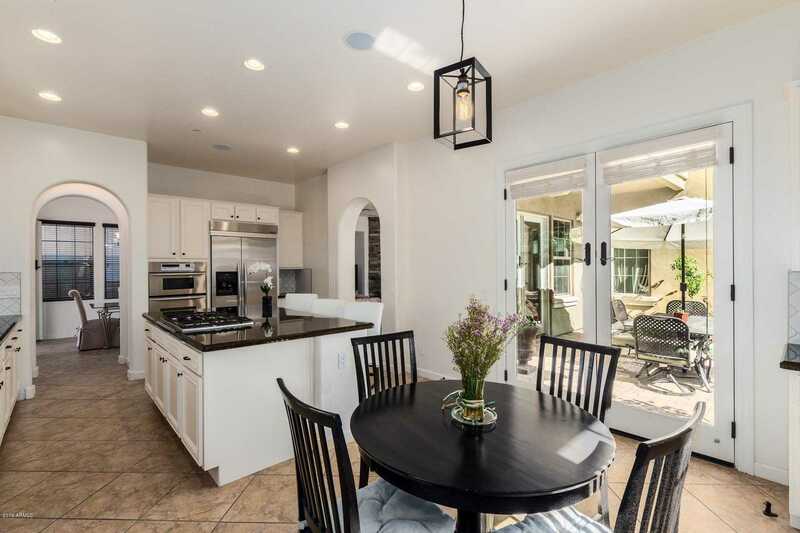 Enjoy beautiful sunsets in the quiet, private backyard oasis that backs to desert wash. Outdoor custom stone fireplace. pond & tranquil fountains. Inviting & open double French doors off the large great room with a stone gas fireplace to one of two covered patios for a relaxing, quiet dining experience. Outdoor built-in BBQ. SS appliances & granite counters, 2019 hardwood & carpet flooring, fresh paint & cabinets updated throughout, main floor en-suite bedroom plus 4 more bedrooms includes game/bonus room with private mountain view decks. Park your sports car or golf cart in 1 of 3 garages.Premium lot. Location!Location! Approximate size: 6761.00 sq. ft. Please, send me more information on this property: MLS# 5880945 – $749,900 – 18332 N 93rd Place, Scottsdale, AZ 85255. I would like to schedule a private showing for this property: MLS# 5880945 – $749,900 – 18332 N 93rd Place, Scottsdale, AZ 85255.